To make someone, you don’t know much about, open unaddressed envelope can be tricky. 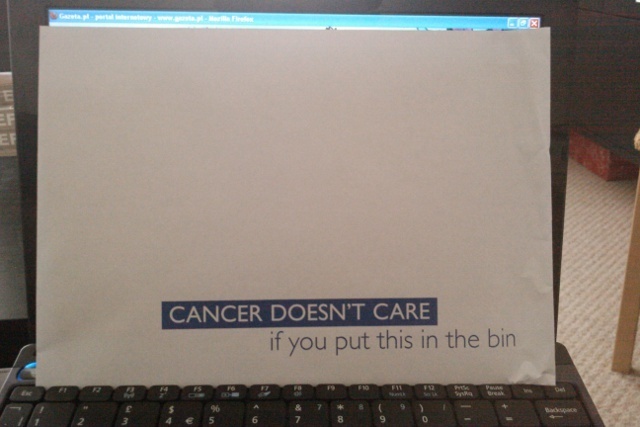 I have to say that what Cancer Research UK wrote here, could give me the impression that they don’t care if I put it in the bin either. But let’s move on. The appeal letter itself reads very well (apart from first paragraph which has font in two colours and some headlining). The copy addresses me all the time and therefore it feels personal. Good size font will make it easy to read for anyone. First part tries to connect to reader. Straight away there is a “thank you” for not throwing it away and reading on. It mentions financial crisis and explains that also big charity like Cancer Research UK has been affected. CR UK asks for only £2 a month and straight away assures me that this little amount would mean a lot to them. That is followed by quick breakdown of their work. Next part of the letter tells me a bit about CR UK achievements over years and shows cancer statistics that only back up the need for their work. Last part is a call to action. “Let’s stand up and fight this disease”. It nicely and rightly asks me not to delay filling in the form as it might end up on the pile of paperwork.It is signed by the Head of Fundraising. There is a post scriptum explaining to the existing donors why they might have received this as well. The donation form surprised me quite a bit as it only allows me to set up Standing Order and not Direct Debit. There is also Gift Aid form on it. It is attached to the letter but perforation makes it easy to detach. It’s easy to post as there is also Freepost envelope in the pack. All in all I enjoyed this door drop from Cancer Research UK. I wasn’t interested by the envelope but the letter copy was in my humble opinion very well written. I a bit disappointed with little choice when it comes to making a donation but the donation form itself is clean and easy to use. I am looking forward to more mailings and I hope you understand that didn’t write this to criticise but just to share my “user experience”. 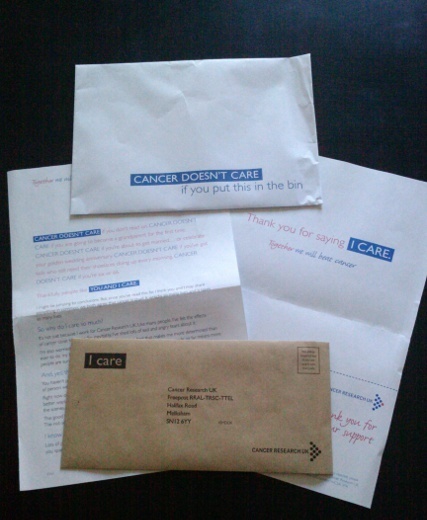 This entry was posted in direct mail, Donors, fundraising and tagged Cancer Research UK, direct mail, Donors. Bookmark the permalink.